When I was a young boy, I wanted to become a legend. Growing up, I realized that becoming legendary requires hard work, some recognised talent and possibly dying young. By the age of forty, I more or less gave up on the idea, and planned to settle for a quiet life. Sort of. In the muddy forests, the swamp like fields and the misty valleys of Belgium Legends are created. 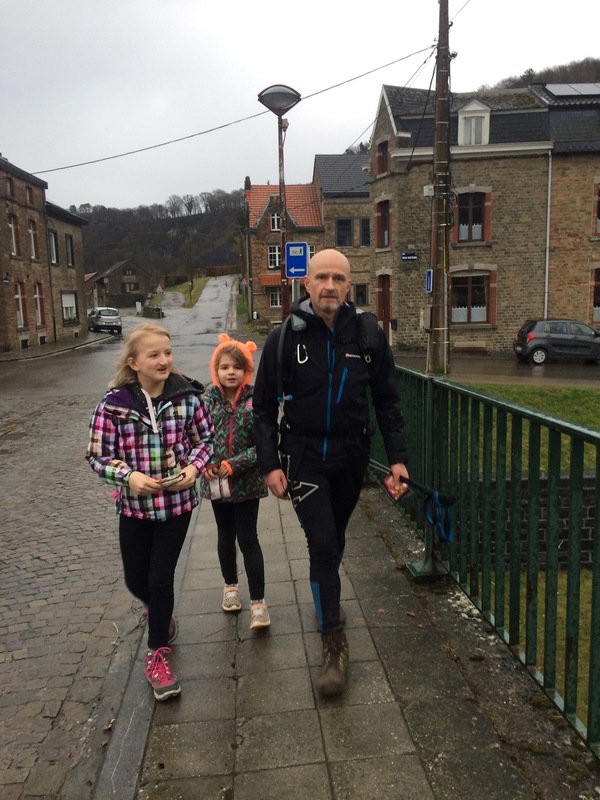 Gnomes, dragons and witches circling through the valleys of the Ourthe river and the Amblève river… Sometimes, we as humans, want to be a Legend and be remembered for a feat of endurance. 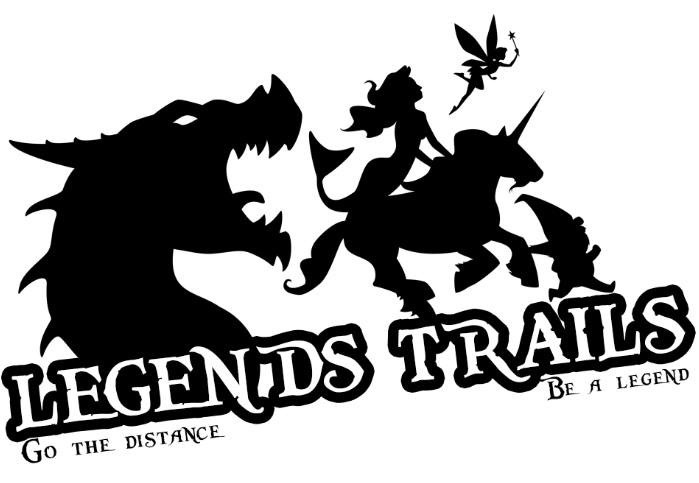 We, from Legends Trail, offer you exactly that! 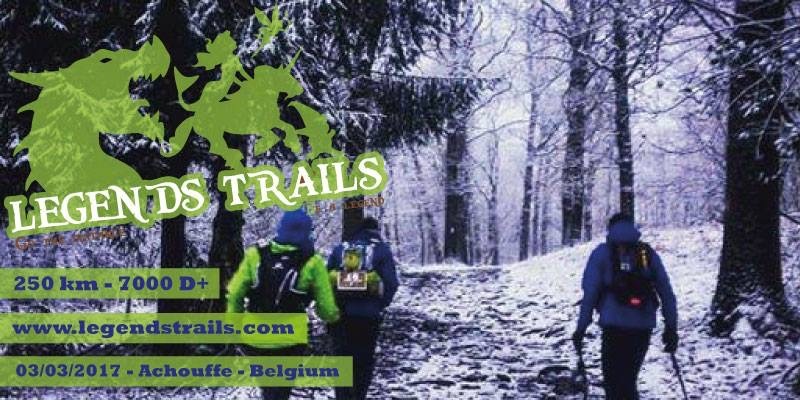 The Legends Trail is a non-stop, unmarked race over 250km in the Southern part of Belgium during winter time. Competitors have 60h to finish the gruelling course, with only 4 checkpoints, and around 7000D+. 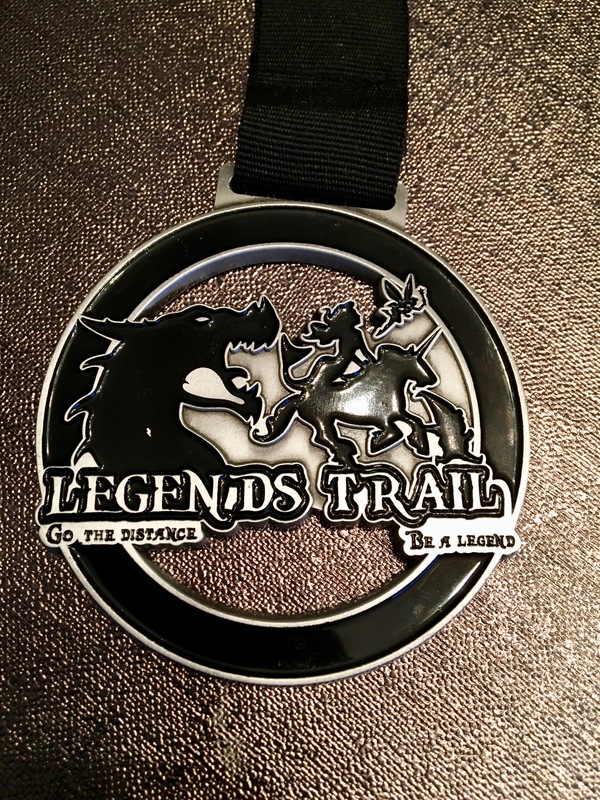 Go the Distance, Be a Legend! Do you know that feeling of galvanized resolve when you realize you have decided and there is no way back? So, I set out on a bigger-than-life Legends training programme. In May, I ran 160 km across the barren highlands of Crete. Barefooted in sandals. In the footsteps of WWII heroes, but still no Legend. Took on the gruelling ascents and descents of 4 massifs around Grenoble in August and felt myself getting stronger in my huaraches. But worried about the Ardennes in March. 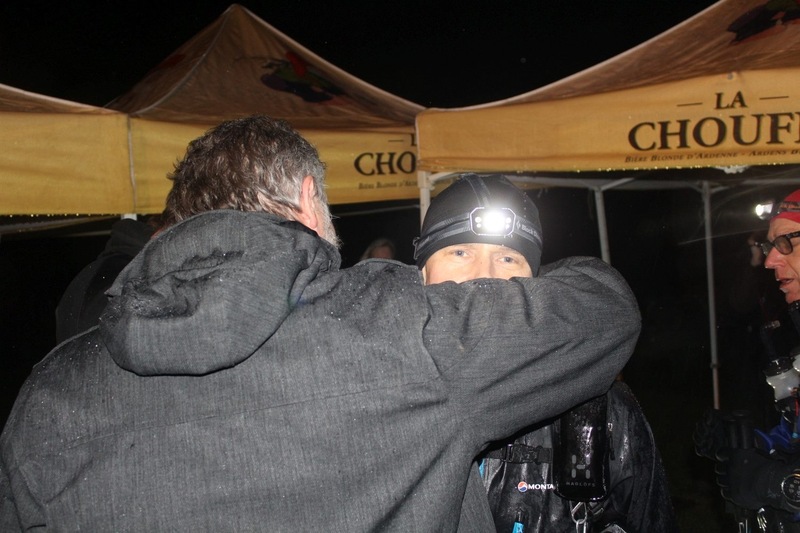 In October, I completed the 182 km Grand Raid des Cathares in tough conditions, and during my barefooted clambering on the Pic de Bugarach with howling winds under torrential rains, I realized that the bigger job still had to come. 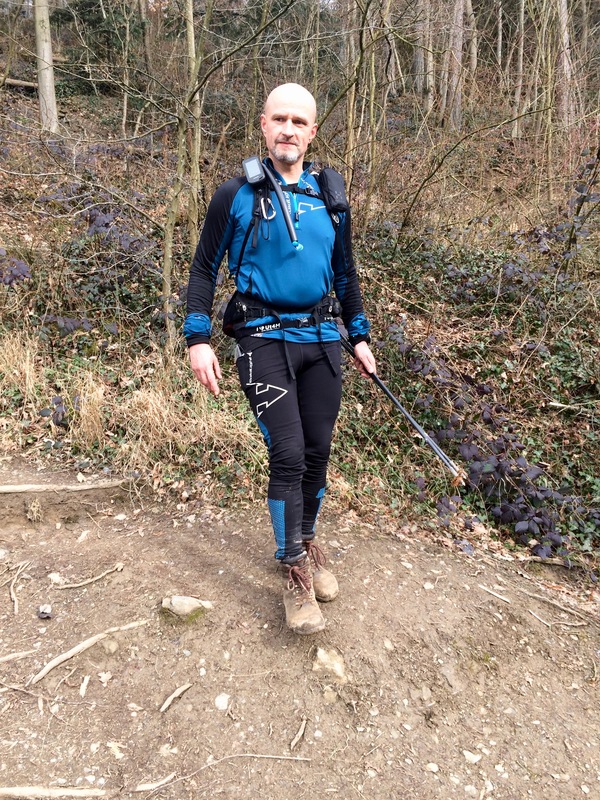 After a little break in November with more than sufficient food and beer, I focused on core strength, stability and gait exercises and had fascia, muscles and tendons loosened up by a specialist. Had my V02 Max evaluated and was encouraged by the result. Time for a reality check. 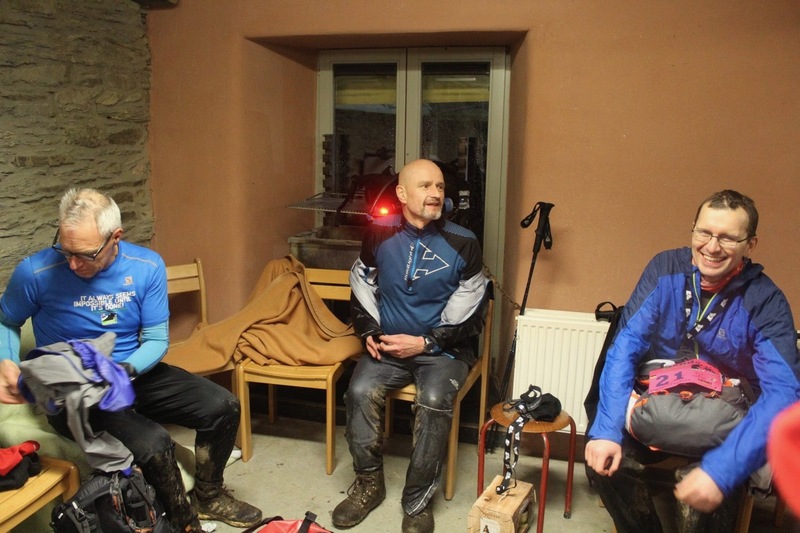 On a freezing December morning, I set off in Stoumont, to reach La Roche about 30 hours later. Pretty much half of the Legends trail solo. Cold. Wet. Exhausted. This was not good enough. Fear, uncertainty and doubt set in. So, I called upon my Legends running buddy Sarah. She went through a similar process after last year’s DNF (Did Not Finish) and was ready and able to go for a next training run on the track. But first the From Dusk till Dawn night run from Trailodge. More weekend runs followed and our resolve grew. We agreed to run our own race in March, but look after each other when needed. And I learned that Buzz, Sarah’s husband would run Legends too. By March, I was ready. Had no other choice but to be ready. I could write a book about Legends preparation and then again probably miss out on half of the aspects. Legends preparation is not about running, although being a good long distance runner certainly helps. And that’s the only thing I am not. Not really. Or maybe just a little bit. Here we are at the start in Achouffe. We took a family holiday nearby, so kids, wife and in-laws are present. We just learned that Buzz and Sarah got the flu and we all hope they will be recovered today. In the mean time they became family friends, and the kids keep on asking where they are. Apparently sleeping to recover. The good news is that they show up and decide to start anyway. What to do in Achouffe? 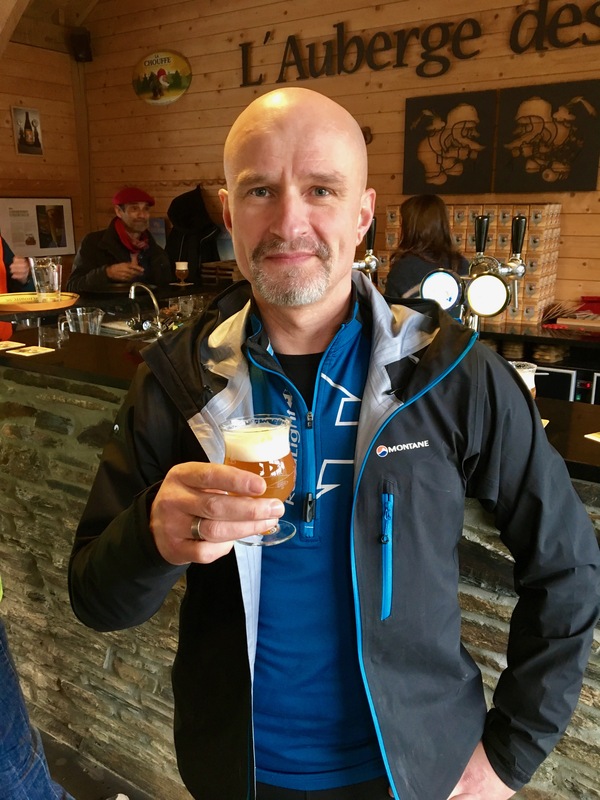 A mini-Chouffe with Patrick! I use the time between the medical check-up and the start of the race for talking to the runners, volunteers, organizers… So many familiar faces. Legends has quickly become a kind of community with people from all over Europe. 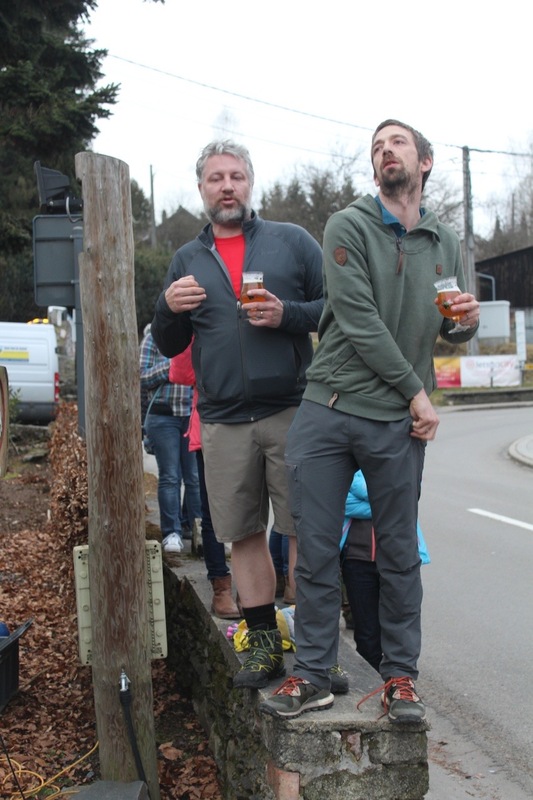 And of course, we are in Achouffe, impossible to refuse a pre-race beer to get the nerves settled. The weather is reasonable, almost warm, no rain expected for the night. That’s a difference compared to last year. The first section is slow and technical, but will be a bit faster because of the drier sections. I take it slow and steady. See participants getting lost and getting back on the track. Or never get back in the course. 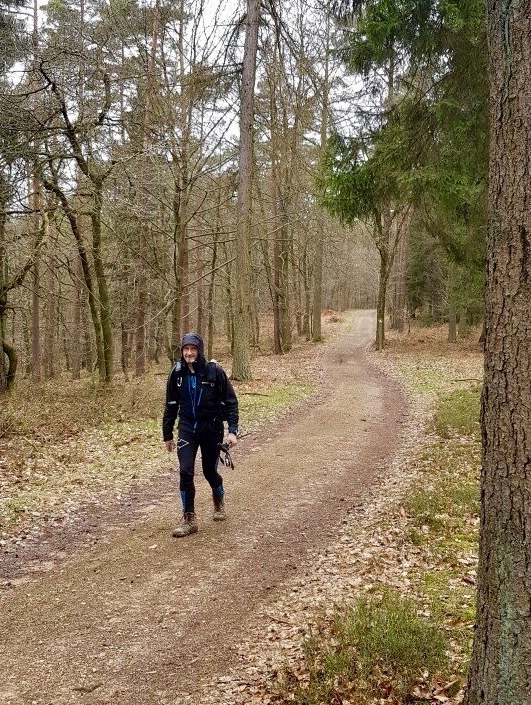 Running unmarked trails with maps and/or GPS is absolutely something different, bad idea to discover that during the race. No problem for me, I know this section by heart and steadily build some additional time buffer on top of my race plan. At times, the idea that I have another 230 km to go is just daunting, but there is sufficient distraction crossing streams and crawling over fallen trees to make me forget. I put on my Vivobarefoot Trackers again. A light, waterproof zero-drop walking boot, with thin but aggressively threaded sole. 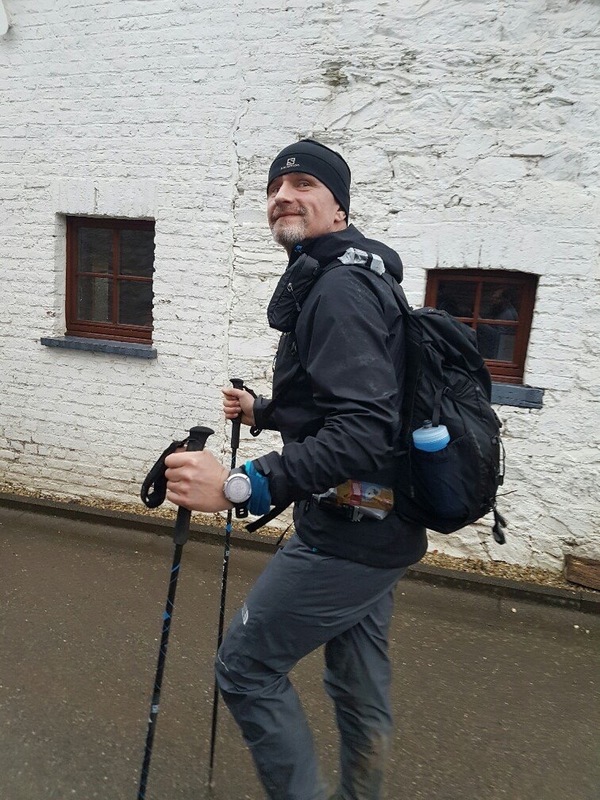 Noticed more and more people are getting convinced to using walking boots at some stage. Makes no sense to move fast for a while just for being killed by trench feet somewhat later in the race. Over the many training rounds, I have developed an almost fail-safe system for foot protection. One day, I’ll write about it. After La Roche, sleepiness sets in but I manage to keep it under control. Feeling comfortable moving alone, I play songs in my head. 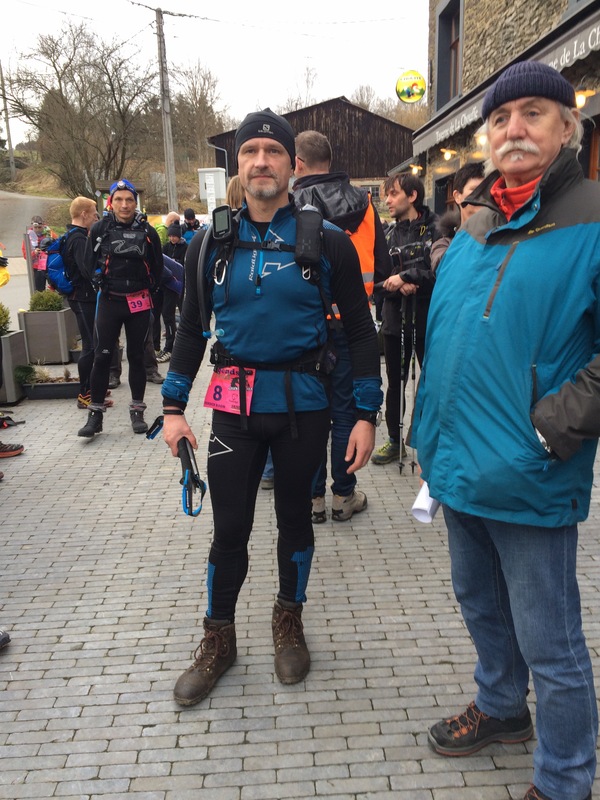 Coming in the checkpoint (CP1) more than 1.5 hours earlier compared to last year feels good and boosts confidence. The first 65 km are in the pocket. No damage whatsoever. When I enter, Sarah has just finished her power nap. Apparently, her fever dropped and she feels better. My race plan tells me I am entitled to 90’ of sleep here, but I decide to keep the break shorter. After an excellent meal (rice and sausages for breakfast), I throw my sleeping bag in the grass next to the canteen of FC Hotton, activate a 60-minute timer, shiver and doze off. Just to be woken up by a couple of rain drops 50 minutes later. Excellent. Feel like reborn. The science of sleep. Something else I learned last year is to finish the drop-bag routines swiftly and precisely. 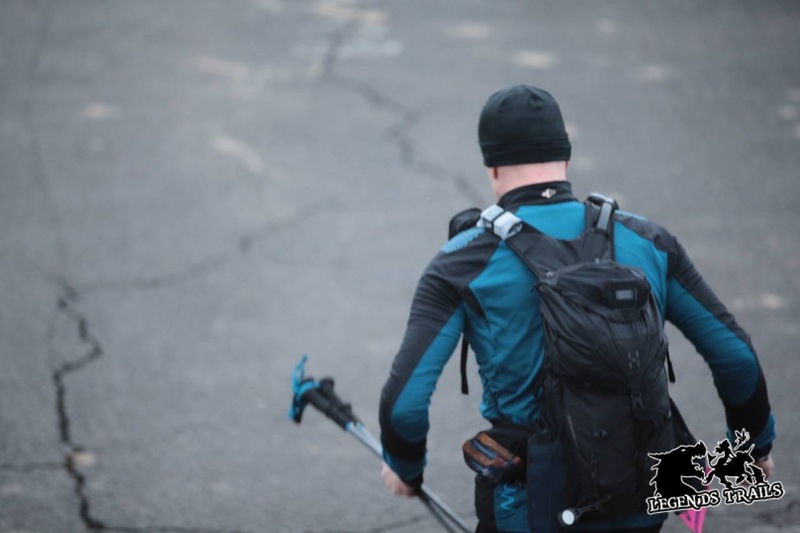 Replenishing food and water, batteries,… and make sure nothing gets misplaced or forgotten to avoid trouble at the next aid station. Still plenty of runners arriving while I leave CP1. One bummer, Buzz feels it’s better to quit at this point. One upside, he will be at all check-points. Preparation is key. My target chart. The second stretch starts well. A mere 55 km to CP2. I feel powerful and this is a daylight section. Enjoy running alone. Over Mont-des-Pins to Palogne… Almost at km 100. I run up the ridge and back down again. And then get this luminous idea. In endeavours as these, the mental aspects are as important as the physical, so I set myself up for a small celebration. “Can you serve me an Orval and 2 expressos’” I ask at the Ferme de Palogne. Heaven in a glass and a caffeine boost. Little Sander is happy now. Less than 15 minutes later, find myself speeding high on the Crêtes de Sy with a heavenly smile on my face. Below I find my family. Only 150 km to go, I tell myself. I feel the sharp stones under the ultra-thin soles of my boots. Permanent foot massage, I tell myself. And then the rain comes. It comes slowly and gets stronger and stronger by the time I reach CP2. And it’s getting dark again. Now we switch to real Legends mode. The break is short. Sleep awaits in CP3. Provided I can create the necessary time for it. Means going on like a machine. But first a Chouffe beer. I will finish this damn thing on Chouffe. Bye family, see you tomorrow. The mud fest out there is crazy. I break a Black Diamond pole. Great, a tough section all alone with one pole. I will only find new spare poles in my drop bag at km 150. Miracles happen when you need them. I bump into an intermediate spot-check under a bridge near La Reid. And Stef has a set of extra poles in his car. Great! Now it gets heavy. The thought of the imminent sleep and the fact that I recently recce’d the terrain with Sarah keeps me going. Finally, I slide down the descent towards the entry of the Ninglinspo valley. Another spot check, manned by Clint and another volunteer. They have Chouffe in the car. There’s one less by the time I head off into the fairy tale country that Ninglinspo is. I feel the fiery breath of the dragon in my neck. The gnomes are melting iron in their caves, ready to torture my lower legs with it. The witches cackle while I beg the fairies for some pixie dust to finish the race. This is where the word gruelling has found its place. Suddenly light down there by the river. What the heck is that one doing there? While I push myself up the hill, the bearer of the light crawls back on the track. It is Martino. Last year DNF, this year bound to succeed. We decide to join forces up to CP3. Bridges, ropes, some disorientation and then… we’re out of the maze. We keep on walking until we reach CP3. Along the way, we see a bunch of Legends runners in a shed. Turns out one must be evacuated because of hypothermia. At the CP, I take my Chouffe, the meal and a pancake, do a full clothes change -every step has been prepared and thought through- and slide into my sleeping bag. Sleep does not come, but at least some rest. Will I make it? Don’t know. Hundred kilometres to go. That’s a fact. There we go again. Alone in the dark woods. Along that crazy Chefna river. What an ascent. Walk me out in the Morning Dew. Grateful Dead. And there is the light. With some volunteers serving coffee. Sarah, Willemijn and Tom caught up on me in the mean time. It turns out they were the ones under the shed last night. Stayed with last year’s female winner Paula until she could be evacuated. No certainties in Legends world. They are speed-hiking fast and I decide to follow them. Even better, they start to run the endless downhill from the cross at Stoumont. Pretty fast. Kilometres fly by. Building the time buffer. This is great. On the uphill towards Coo I adopt my own pace again. Until I catch up with them at a tent manned by Buzz and another guy. With excellent soup. Do you have Chouffe? Yes, we have. Beer for breakfast. Great! Over the waterfalls and back into the woods. With 7 kg on the back. The afternoon brings rain… lots of rain. In the woods above Trois Ponts, I meet Buzz again. Somehow, he manages to motivate me. With his long beard he reminds me of the Chouffe gnome. It seems I am shifting up in the ranking. Lone Wolf… later it turns out that I have spent some 210 km all alone. Most in the dark. 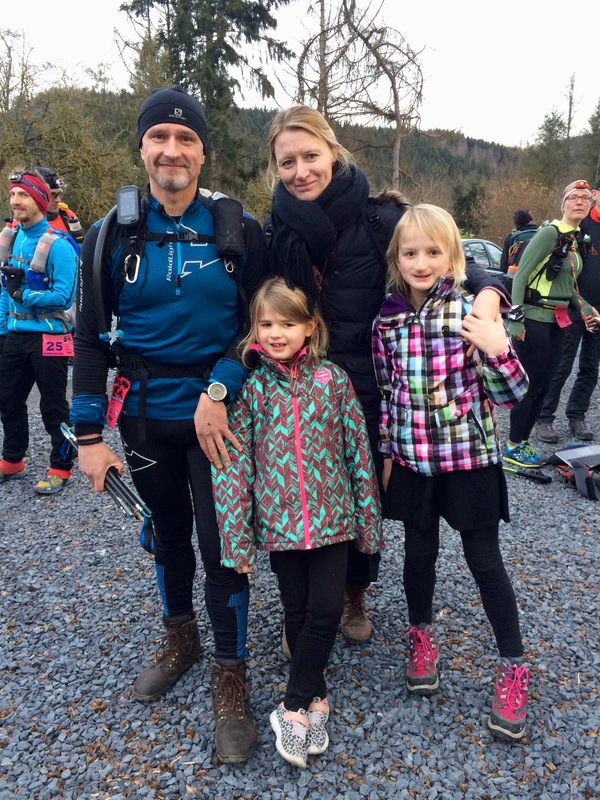 I meet Sofie and the kids for a last time at km 196. They drive off. School tomorrow. And I have the prospect of another lonely night. Motivation falls to a low. But I know CP4 is close. From there only 47 km to go. Including the cold heights of Baraque Fraiture, wet marshlands, endless woods and muddy sections until Achouffe. Followed by a last tricky loop toward the race HQ in Petite Mormont. I entitle myself to 45 minutes at CP4 and use them well. Macaroni and meatballs. And a Chouffe with Hans. And a super volunteer team, consisting entirely of last year finishers. 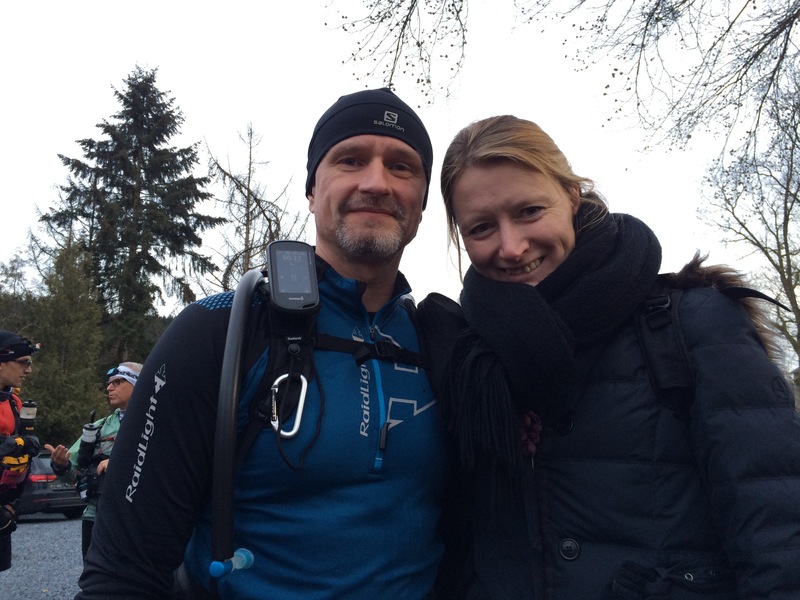 Geert, Hans, Marek, Paula, … never had a better support crew. High speed departure with Robin while the night falls. After a while we get overtaken by a team. Robin joins, and I decide to continue at my own pace. An endless hike through deep mud in dark forests. Quagmire. The much-feared hallucinations stay away. The decision to nap at CP1 seems to have been the right one. Finally, the ascent towards Baraque Fraiture. I cannot explain what happens here. A burst of energy rips through my body while I mount at a crazy speed. Up there a party tent. Hallucination? No! Hot coffee. I catch up with the whole bunch and start moving at high pace. My knowledge of the terrain turns out to be an asset and we progress fast into the swamps. I am terribly happy I did all those recce runs and save the team some valuable time. In Censes, the great crossing to Achouffe starts. Endless woods. Deep mud. I lead my little pack, knowing that now it is only a matter of hours. We tell ourselves that unless we break our bones, we are Legends already. But this is tough. So tough. And yet so light. What else is there than to continue and push forward? So pure a reality. It is hard to describe the bond created between people at such point. You barely know each other and yet the common suffering makes you feel like you’ve known each other for ages. François is right behind me. Last year we both stranded at CP3. This time we’ll finish, he says. Right you are, sir. Robert is still with us and does not hide he’s happy to run in our pack. Me too. The last section is heavy, as the muddy track leads us in and out of the river, up the plateau and then via a long climb to the heights that will eventually bring us to the finish. Finally. A last climb and a last descent and we throw ourselves towards the finish line. “Go the distance, get the bling”, I yell, but the applause is taking the words away. 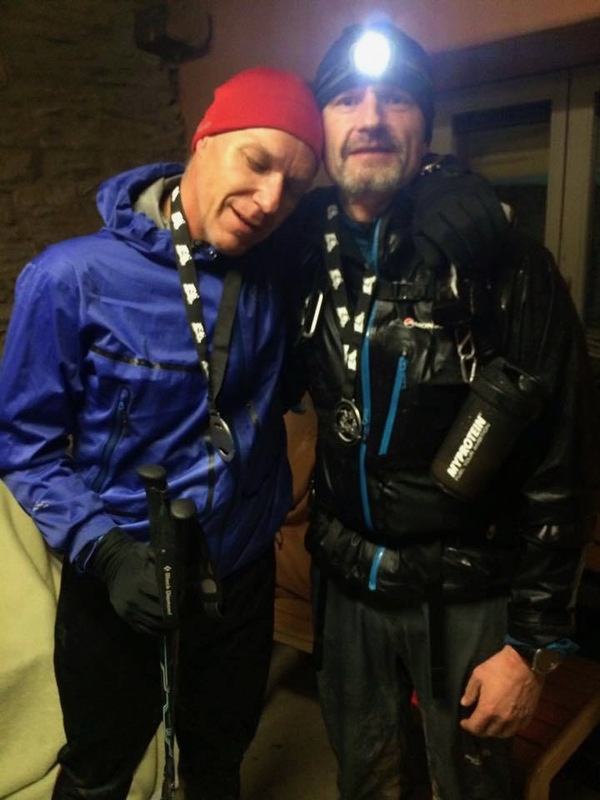 The medal, the hugs, the immense sense of accomplishment… What the hell. We just moved 250 km on foot and climbed the equivalent of the Mount Everest in less than 59 hours! The beers and the pizza are waiting. Turns out many people have been following my tracking dot on the internet. Even better. My wife congratulates me from home. Lady, it is 4:30 in the morning, you know that? Thirty minutes later Sarah comes in, together with Tom and the other female finisher. The handshake, the camaraderie. We are Legends, nobody can ever take this away from us. I can only add my appreciation for the audacious idealists Tim De Vriendt and Stef Schuermans. They and their nearest, aided by a whole community of volunteers, show how the world can be. And altered our lives since that summer day in 2015. 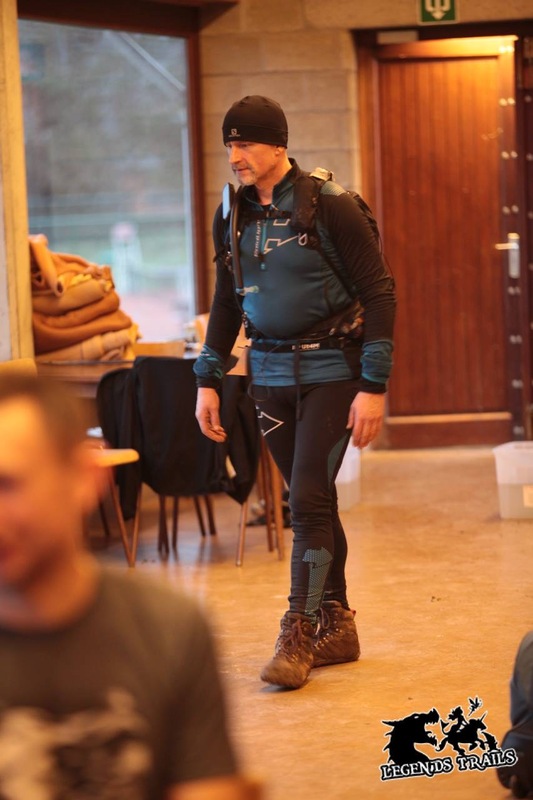 When a guy on Facebook asked: would you be interested in an ultra-long trail race through the Belgian Ardennes, unmarked, the hardest in its kind? Luckily, I said yes. PS: Don’t get mistaken by the beers. The safety management of this race is some of the most professional I have ever seen. The logistics is top-notch. And the race is no joke. I finished one of your races, Tim. And which one? The one. Proficiat Sander, hard voor gewerkt en dubbel en dik verdiend! Mooi artikel, buddy. Maar bespeur ik daar nu een zweem van jeugdig enthousiasme? Mooi verslag Sander, het leest alsof je er zelf bij bent. Proficiat Legend! Mooi geschreven, wat een avontuur! Excellent story told. It was a fantastic experience to do the hardest trail kilometers of my career together with you. What a great sportsmanship how you paced Francois and me through this gruesome, never ending last 25K. Painful 6 hours, legends forever. Hope to run with you again. Thank you for this great compliment!